Stick of Gum a Day, Helps Keep the Dentist Away! Is This True? Our Idaho Falls Dentistry office is happy to announce that we are now a preferred provider for Met-Life dental insurance. We encourage all of our neighbors and friends in the Southeastern Idaho community who are insured by Met-Life to please give us a call. We look forward to providing you with excellent, comprehensive dental care. Some may say that good, dependable employees are hard to come by, but Sheila has proved that saying wrong! 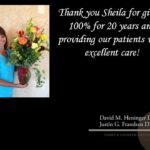 Thank you Sheila for giving 100% for 20 years at our office! 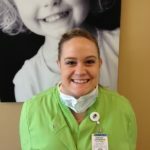 You always have a big smile to welcome our patients and consistently give them the quality care they need. We appreciate all you do and look forward to the many years to come! 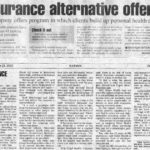 The Post Register ran an article on Saturday, June 23, 2012 about Direct Health. 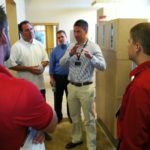 Our own Dr. Justin Frandsen was interviewed and quoted in the article. Our office is proud to be a Direct Health provider. If you have any questions about Direct Health, please give us a call at (208) ­524-1700. Congratulations Dr.Frandsen! One of Idaho’s Top Dentists 2012! 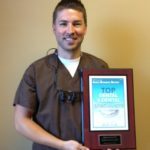 We want to congratulate Dr. Frandsen for being selected as one of Idaho’s Top Dentists for 2012 by the Idaho Business Review! We appreciate the addition he has been to our office as he brings new ideas and up to date techniques to continue to provide our patients with consistent quality dental care! Meet Whitney, our new intern. Meet Whitney, our new intern from EITC’s dental assistant program. We are happy to have Whitney in our office helping our patients and learning from our experienced staff. Education is very important to our office, and we are excited to help advance Whitney’s dental career. We are excited to introduce you to our website. Come back often for important updates and news about everything going on here.